Devi Kund sagar is situated 8 km in the east of city. 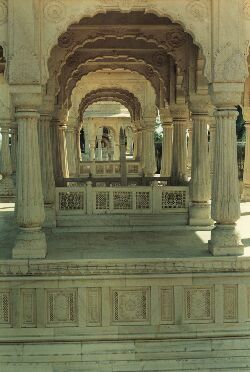 The members of ruling family of Bikaner subsequent to Jet Singh, the great grandson of Rao Bikaji, have been cremated here.On the sides of reservoir of water lie the Royal cenotaphs of rulers of Bikaner dynasty from Rao Kalyan Singhji to last Maharaji Karni Singhji as well as those of their wives and other important members of families.There are cenotaphs (Chhatries) of 22 SATIES of royal family prior to Maharaja Gaj Sigh Ji (1745-1787). There is also one cenotaph of a SATA (male sati) of a ruler.The architecture of the cenotaphs is the prime attraction of this place. Maharaja Surat Singh’s Chhatri is built entirely in white marble with spectacular Rajput paintings on its ceiling. Close by is a Dargah of Rustal Ali Shah Peer which is held in high esteem by muslim community and other people.